Frigates Of Russian Naval Task Force Holds Anti-Submarine Warfare Drills Near Syria 4.5555555555556 out of 5 based on 9 ratings. 9 user reviews. The Russian Black Sea Fleet’s frigates Admiral Makarov and Admiral Essen participated in anti-submarine warfare drills in the Mediterranean Sea, the Fleet’s press office reported on November 16. “Drills were held to practice searching for and tracking a submarine, searching for, rescuing and providing medical assistance to persons in distress at sea,” TASS quoted the press office statement. The drills involved Kamov Ka-27PL and Ka-27PS helicopters, which made about 30 takeoffs and landings onto the decks of the frigates, according to the report. The Admiral Makarov and the Admiral Essen are Project 11356R/M (11357) multipurpose frigates designated to destroy surface combatants, submarines and enemy ground facilities as well as carry out patrols and protect sea communications. The Project 11356R/M frigates are armed with 8 launching cells of Kalibr-NK cruise missiles, which are capable of striking surface, coastal and underwater targets at a distance of up to 2,600 km. Other weapons are Shtil-1, Palash and AK-630M air defense missile and artillery systems, A-190 100mm universal artillery guns, torpedo tubes and RBU-6000 rocket launchers. The frigates of this project also have a take-off and landing strip and a hangar for one anti-submarine warfare helicopter (Ka-27 or Ka-31). I didn’t make it to the natural spaceport on my last ET/ED contact recon op that I ran that I’ve identified on satellite imagery because of the difficulty getting there due to the terrain. This weekend I’m going to attempt it again and I’m going on the assumption that bigfoots may be present and that there will be potentially dangerous interaction with them. Or that there may be interaction but that it can be managed in a manner that isn’t negative. I’ll be equipped to engage in hostilities with multiple adversaries. Hopefully it won’t develop in that direction. Please do not shoot any bigfoots Richard. Sasquatch has been put on the endangered species list in some areas. I am serious! 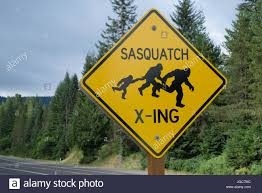 That’s true, there have been local governments that have made it illegal to shoot a bigfoot. From the sounds of it they’re an early human species with ET handlers that for whatever reason don’t want them verified. But self defense laws would apply just like with animals or homo sapiens. And there are reports of their involvement in abductions and violence against humans. Some native Americans say that if you kill one of them, they’l kill 3 of you. 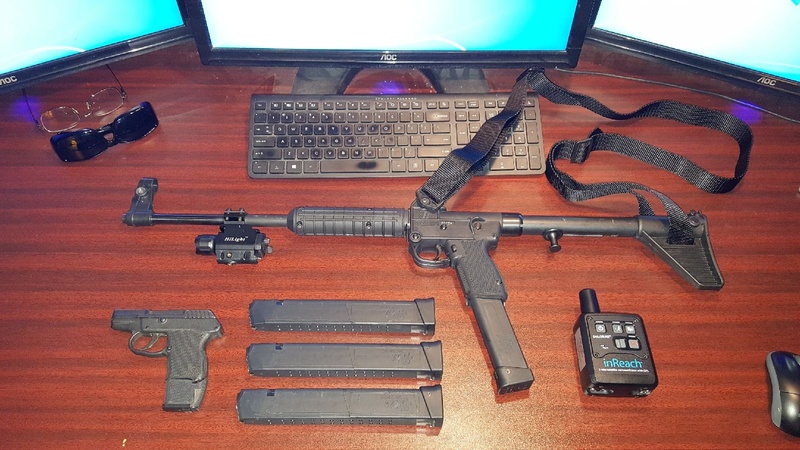 I’m sufficiently concerned about it that I went to the indoor shooting range today and test fired the 9mm pistol and .40 S&W folding carbine to see if they will get the job done in the event of hostilities. Naturally I’d rather get along with the cryptos than fight them. But I have to play the cards that I’m dealt and the ones that I encountered at night last summer were loud and potentially aggressive. There may be a genetic component to their make up that makes the dimensional construct that they exist in similar, but not completely the same as ours. Which when coupled with technology employed by ET associates may account for the non conventional nature of their interaction with us. 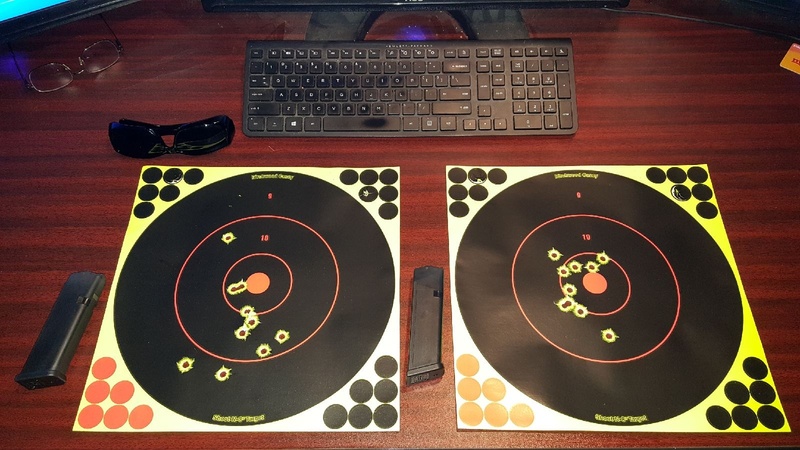 These are two 10 round mag dumps with the targets against the back wall at the indoor shooting range at a distance of about 20 yards using the red laser sight that I had the gunsmith install and sight in on my Sub 2000. It’s probably good for head shoots at that range and center of mass shoots quite a bit further out. Remember the Norwegian frigate that was involved in a collision and sank recently? Well it seems Norway wants to question a US naval officer who was onboard as a part of a swap deal between the US and Norway. Now the only reason Norway would want to question this guy is because he was on duty at the time. So although Norway seems to want to blame Russia for the ships loss, it might be another American cockup. I have worked with the US Navy, they are total amateurs. My old ship the HMAS Melbourne cut the US destroyer Evans in half, because the American ship turned across the bow of the Melbourne. Even though it was obviously a stupid mistake by the Evans, the Captain of the Melbourne was blamed. Then why isn’t the Indian Navy in control of the seas?